A decade ago a £10 loaf going on sale in the UK prompted raised eyebrows in the press. This has been the era of the posh loaf. So has this ultimate food staple been through a revolution? This is a tale of two breads. In one corner is a sliced, white loaf in a branded plastic bag. Its neck is sealed with a plastic twist. Its name is redolent of the olden days, but it was made using the Chorleywood Process. It is a modern, sliced, loaf. In the other corner is an unsliced sourdough loaf. It comes in brown paper. It's not the same shape. It's a pave. Or a boule. Or a bloomer. It is peppered with olives, potatoes, or nuts and seeds. This is a posh loaf. And the last 10 years have been the decade of the posh loaf, a period of disenchantment with the squishy white processed loaf of yesteryear. The loaf that generated attention in 2002 was from artisan bakers Poilane and cost £9.62. Poilane opened two stores in London, in upmarket Belgravia and Chelsea. Waitrose sells cheaper Poilane loaves - for between £4-6 - with sale up 5% on last year. Sales of Gail's luxury breads in the chain have risen by 16%, while Waitrose speciality breads are up by 18%. These expensive bread sales are concentrated within London, but the same phenomenon can be seen in instore supermarket bakeries across the country. People are apparently willing to pay more, and sometimes significantly more, for a "luxury" loaf. Meanwhile the humble packaged sliced white - which is still the nation's favourite type of bread, accounting for over a quarter (£920 million) of the total bread and baked goods market value - is on the decline. It was hit by a 3% drop in sales between 2010-11, according to Mintel. Of course breads come in all shapes, shades and sizes, and there's an extraordinary variance of prices. Go and buy the cheapest pint of milk at your local supermarket. Then have a look at the most expensive organic one. The difference isn't huge. But bread is different. Loaves can cost anywhere between £1-£4. You only have to watch the Great British Bake Off to notice the sea-change in the way we buy bread. But there is something strange about bread - always a staple food - being transformed into a luxury item. History has told us time and time again bread is a basic. Give us this day our daily bread, the Lord's Prayer asks. Man cannot live by bread alone, the saying goes. And it was only 15 years ago that supermarket price wars saw chains such as Asda and Tesco slash their own-brand 800g white sliced loaf to as little as 9p. In 1999, Kwiksave sold its "no frills" loaf for 7p. For many people it seems strange spending £3 on a loaf of bread and yet, even in the current downturn, people are doing it. Gordon Polson, the director of the Federation of Bakers, says the biggest boost to the bread market has been its variety. "Twenty years ago it really used to be about white bread or brown bread. 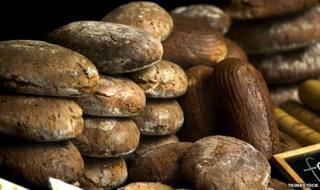 Now there are all kinds of bread, not just in bakeries, but on supermarket shelves," he says. There are crusty baguettes and bagels. There are croissants, chapattis and ciabattas. For those partial to Indian food, there are even parathas and parottas. But Polson says we are also consuming bread differently. "We used to have bread and butter with a meal. Now we are eating bread at different times of the day, in different ways," he says. Anti-carb diets such as Atkins, and concerns over gluten or wheat intolerances, have taken bread off the table in certain quarters. One man who has managed to convince shoppers that £3 is a sensible sum to spend on a loaf is Tom Molnar, one of the owners of Gail's artisan bakery chain. Under his stewardship, Gail's - which sells everything from potato and rosemary sourdough to spelt and sunflower tin loaves - has expanded from a single bakery in Hampstead in north London, to a baker's dozen, dotted around the capital, in seven years. "As a nation, we took bread to a really low level," says Molnar. "We made it super cheap, but it wasn't tasty, or healthy. It got to a point that it wasn't interesting anymore, and when we do that kind of thing, there is a chance of a rebirth," he says. "Our San Francisco sourdough, for example, takes three and a half days. It has two 'mothers' [a starter dough, used in place of yeast] which slowly breathe together. It's like the Swiss cheese of bread, it's got a beautiful creamy taste," he says. Molnar believes the expensive loaves being bought are not a faddy luxury item. And he wants to dispel the notion that good quality bread is posh. "For the price of a coffee or smoothie in a shop, people can feed a family for breakfast, or as part of a meal, for days," he says. Chris Young, from the Real Bread Campaign, says that "delicious, tasty bread, with flavour", is a good investment. Why do we waste so much bread? "Bread is still one of the cheapest things you can buy. You can probably get five sandwiches out of a loaf, so you might as well pay £2.50 for a really nice one, rather than £1.50 for an average one," he says. Young wants people to recognise the value of buying - or even baking their own - quality bread. But he says there will always be those that turn to white slice. "Some people don't care what's in their bread, or what it smells like - so long as it fills them up, and it's cheap. "Others are struggling with costs and have other priorities. And then there will those that really appreciate good quality bread, but are only willing to splash out once a week, as a treat," he says. Charles Banks, co-founder of food trends agency the Food People, agrees that there will always be demand for bread "that is essentially a carrier for other things", especially when it comes to children's meals. But he says the luxury bread boom is here to stay. "People understand that this artisan bread, with its distinct flavour profiles, texture and developed crust, is a very different food experience to what is known as the white sliced 'fluff'," he says.